„Antikraak“ : Tochter Mus springt auf einem Trampolin. The Netherlands have a large squatter scene - even though "Kraak" (Dutch for squatting) has been illegal for several years now. "Antikraak" is a model for interim use designed to prevent squatting: Vacant properties (flats, office buildings, doctors' offices) are rented out to people for little money before they are demolished or sold. They are therefore paying a lot less, but also have fewer rights than usual tenants. 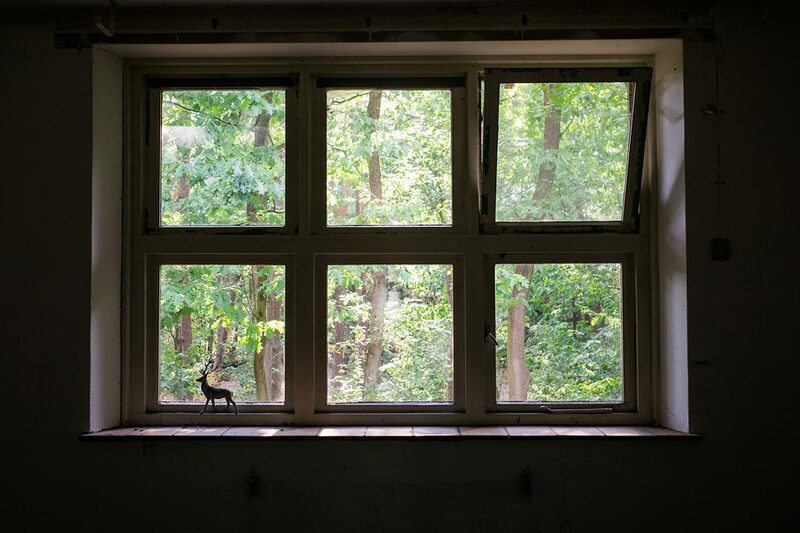 ​"When we heard about the transformation plans of the barracks in the forest near Schaarsbergen into a cultural enclave, we were interested immediately,” says Marcel Daelmans. His wife Maartje Kunen explains: "The studio apartments are being built and afterwards rented in cooperation with a housing association. Great, right? We can live together in the forest as a group of like-minded people, we have enough space for the children and we can both pursue our creative work". Marcel is an artist and painter, Maartje is a medical illustrator. Their son Jarra is twelve years old, their daughter Mus is 14 years old and the family has been living in the barracks on Koningsweg for six years already. 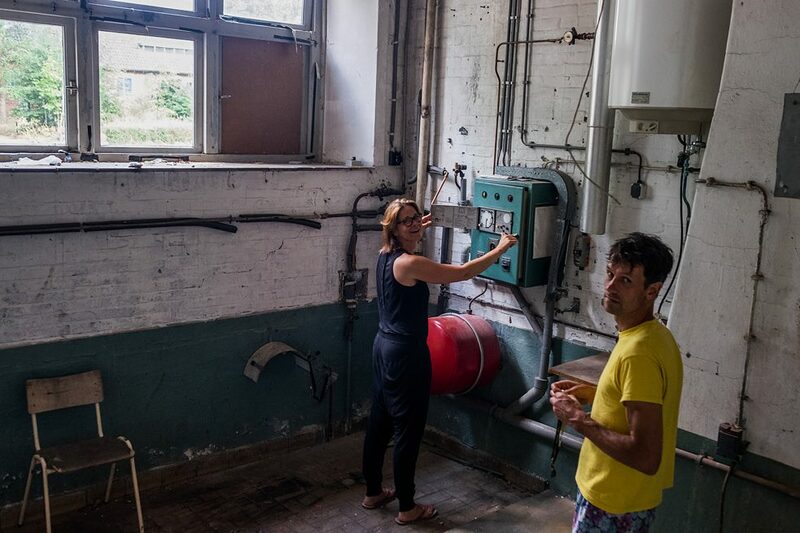 "We read about this project in a newsletter of the SLAK Foundation, an Arnhem-based organization that helps artists to find spaces for studios. We had already lived in empty “Antikraak” houses of this foundation. We thought it would be better for our eldest daughter to move before she went to secondary school. When our daughter was eight years old, we therefore decided to live on the premises of the barracks in anticipation of the project. It was officially not an anti-squatting house, because in the Netherlands it is forbidden by law for people who have children. However, due to the vacancy law, it was possible to anti-squat empty barracks and "Bunkerbeorderijen" (editor's note: bunkers that were built in the style of farms during the Second World War). 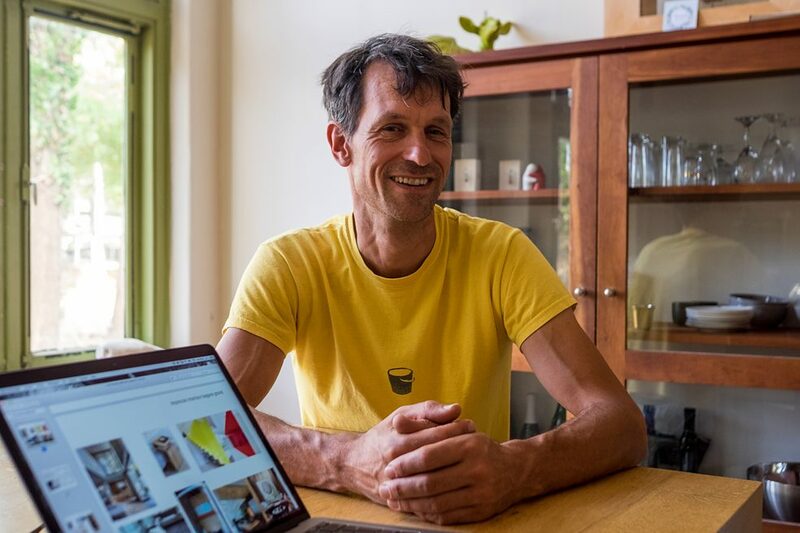 ​Marcel tells about how they lived together with a group of people and families in anticipation of the transformation of the building into rental apartments. "But then there came a crisis. The housing cooperation 'Portaal' had to abandon some projects and decided on this project, unfortunately. For some residents it was a curse, for us it became a blessing. Since we lived on site and were in direct contact with the project developer, we made the plan to buy one of the vacant houses with four families that had a fixed income. Instead of eight rented flats, there are now four condos." Maartje goes on: "Because we agreed on the price during the crisis, we were able to keep this price extremely low. Soon there will be four of us living on an area of 270 square meters, in a three-storey high house." "It took a long time until the house was finally granted a residential permit. Only with this permit, we were able to get a mortgage." The house was built during the Second World War for the so-called "Blitzmädel" – German women who supported the army by controlling the airspace from the "Diogenes" bunker in Deelen. "The dormitories in the house, which used to be the dormitories for the women, are now being transformed into studio apartments. At the moment, we live on the other side of the old bar of the colonels. We hope to move into the other building in October." 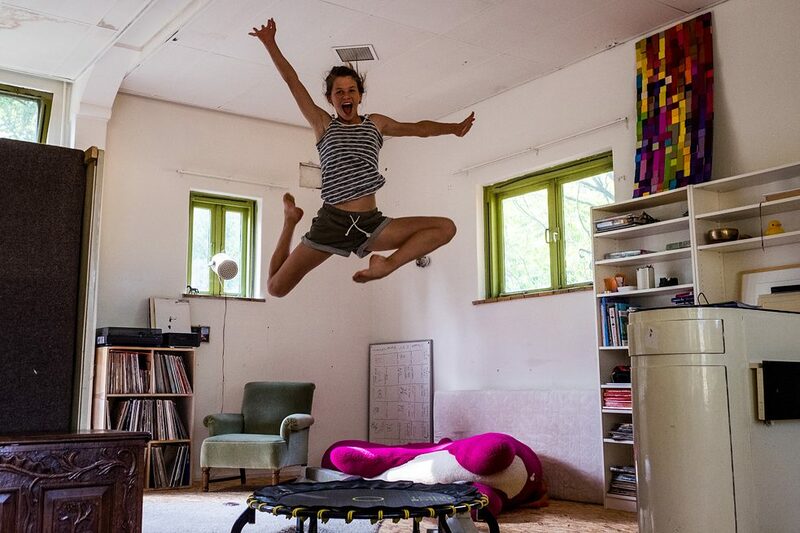 Daughter Mus climbs on the trampoline in the living room: "I think it's very nice to live here. The only thing that I don’t like is that it's often cold in the winter because we can't heat the whole house. But that will be different in our new house." In addition to the barracks buildings, there are also some bunker-like farms on the site, which are also for sale and are currently being renovated. The land-use plan states that the site will also be used for exhibitions and cultural activities.